This paper was presented at a meeting of the American Psychological Association at Cincinnati, Ohio, September, 1959 and was published in the American Psychologist in January, 1960. This is the history of a crackpot idea, born on the wrong side of the tracks intellectually speaking, but eventually vindicated in a sort of middle class respectability. 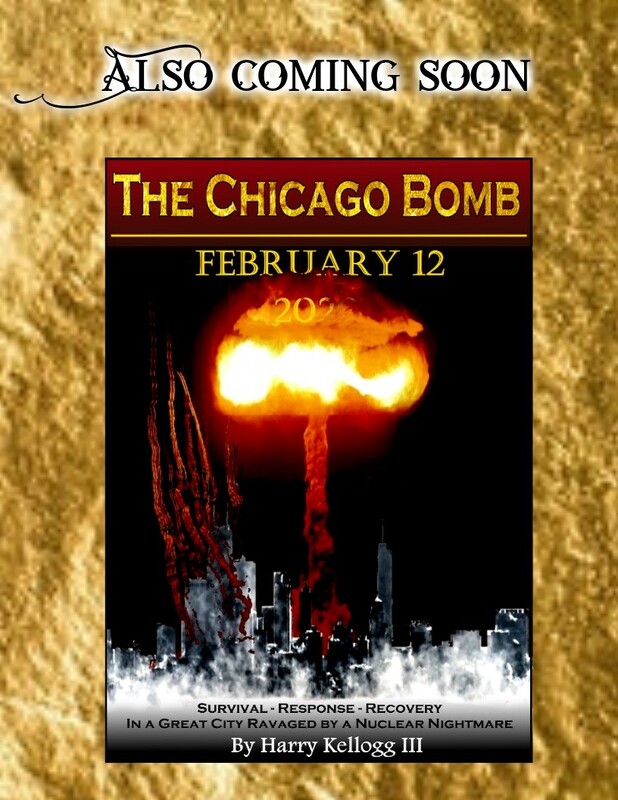 It is the story of a proposal to use living organisms to guide missiles—of a research program during World War II called "Project Pigeon" and a peace- time continuation at the Naval Research Laboratory called "ORCON," from the words "organic control." Both of these programs have now been declassified. The detecting and signaling systems of lower organisms have a special advantage when used with explosive devices which can be guided toward the objects they are to destroy, whether by land, sea, or air. Homing systems for guided missiles have now been developed which sense and signal the position of a target by responding to visible or invisible radiation, noise, radar reflections, and so on. These have not always been available, and in any case a living organism has certain advantages. It is almost certainly cheaper and more compact and, in particular, is especially good at responding to patterns and those classes of patterns called "concepts." The lower organism is not used because it is more sensitive than man—after all, the kamikaze did very well—but because it is readily expendable. The ethical question of our right to convert a lower creature into an unwitting hero is a peace- time luxury. There were bigger questions to be answered in the late thirties. A group of men had come into power who promised, and eventually accomplished, the greatest mass murder in history. 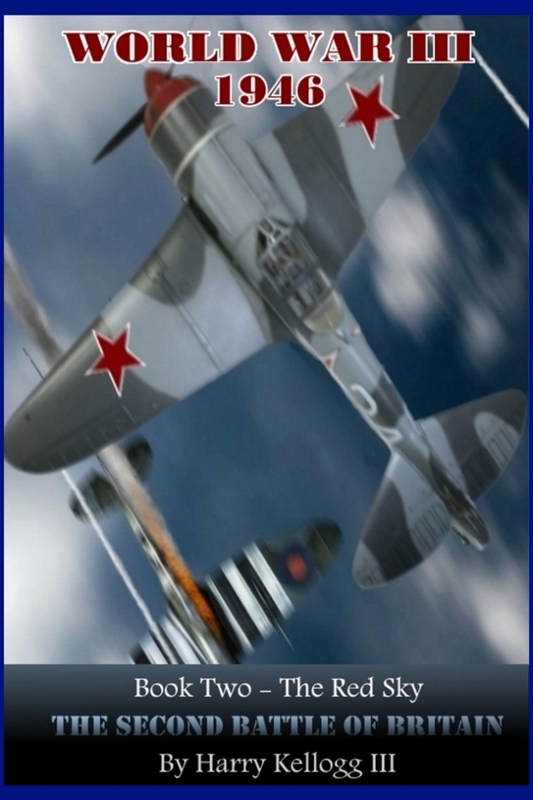 In 1939 the city of Warsaw was laid waste in an unprovoked bombing, and the airplane emerged as a new and horrible instrument of war against which only the feeblest defenses were available. Project Pigeon was conceived against that back- ground. It began as a search for a homing device to be used in a surface-to-air guided missile as a defense against aircraft. As the balance between offensive and defensive weapons shifted, the direction was reversed, and the system was to be tested first in an air-to-ground missile called the "Pelican." Its name is a useful reminder of the state of the missile art in America at that time. It’s detecting and servomechanisms took up so much space that there was no room for explosives: hence the resemblance to the pelican "whose beak can hold more than its belly can." My title is perhaps now clear. 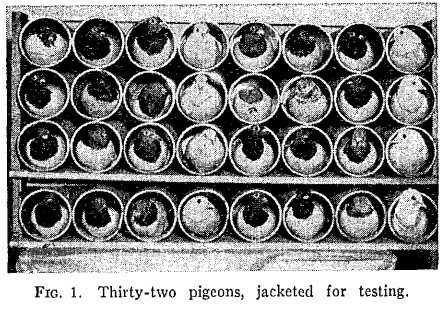 Figure 1 shows the pigeons, jacketed for duty. Figure 2 shows the beak of the Pelican. At the University of Minnesota in the spring of 1940 the capacity of the pigeon to steer toward a target was tested with a moving hoist. The pigeon, held in a jacket and harnessed to a block, was immobilized except for its neck and head. It could eat grain from a dish and operate a control system by moving its head in appropriate directions. Movement of the head operated the motors of the hoist. The bird could ascend by lifting its head, descend by lowering it, and travel from side to side by moving appropriately. The whole system, mounted on wheels, was pushed across a room to- ward a bull's-eye on the far wall. During the approach the pigeon raised or lowered itself and moved from side to side in such a way as to reach the wall in position to eat grain from the center of the bull's-eye. The pigeon learned to reach any target within reach of the hoist, no matter what the starting position and during fairly rapid approaches. The experiment was shown to John T. Tate, a physicist, then Dean of the Graduate School at the University of Minnesota, who brought it to the attention of R. C. Tolman, one of a group of scientists engaged in early defense activities. The result was the first of a long series of rejections. The proposal "did not warrant further development at the time." The project was accordingly allowed to lapse. 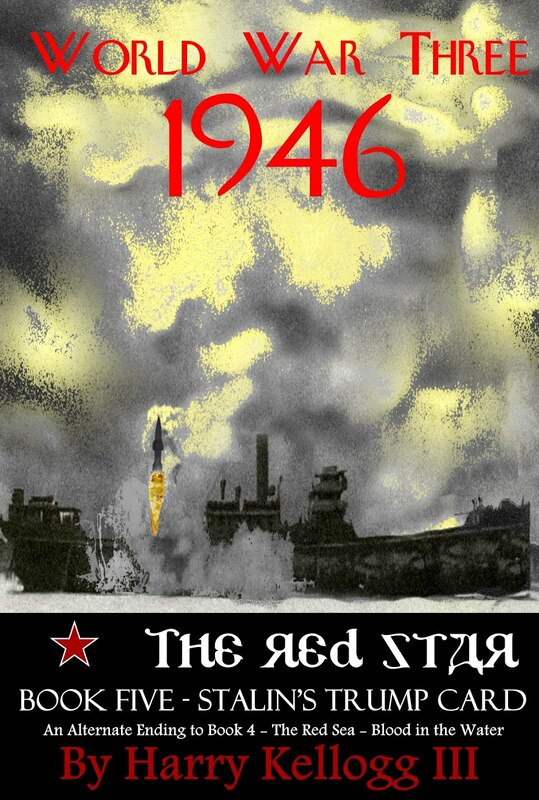 On December 7, 1941 the situation was suddenly restructured; and, on the following day, with the help of Keller Breland, then a graduate student at Minnesota, further work was planned. A simpler harnessing system could be used if the bomb were to rotate slowly during its descent, when the pigeon would need to steer in only one dimension: from side to side. We built an apparatus in which a harnessed pigeon was lowered toward a large revolving turntable across which a target was driven according to contacts made by the bird during its descent. It was not difficult to train a pigeon to "hit" small ship models during fairly rapid descents. We made a demonstration film showing hits on various kinds of targets, and two psychologists then engaged in the war effort in Washington, Charles Bray and Leonard Carmichael, undertook to look for government support. Tolman, then at the Office of Scientific Research and Development, again felt that the project did not warrant support, in part because the United States had at that time no missile capable of being guided toward a target. Commander (now Admiral) Luis de Florez, then in the Special Devices Section of the Navy, took a sympathetic view. He dismissed the objection that there was no available vehicle by suggesting that the pigeon be connected with an automatic pilot mounted in a small plane loaded with explosives. But he was unable to take on the project because of other commitments and because, as he explained, he had recently bet on one or two other equally long shots which had not come in. The project lapsed again and would probably have been abandoned if it had not been for a young man whose last name I have ungratefully forgotten, but whose first name—Victor—we hailed as a propitious sign. His subsequent history led us to refer to him as Vanquished; and this, as it turned out, was a more reliable omen. Victor walked into the Department of Psychology at Minnesota one day in the summer of 1942 looking for an animal psychologist. He had a scheme for installing dogs in antisubmarine torpedoes. The dogs were to respond to faint acoustic signals from the submarine and to steer the torpedo toward its goal. He wanted a statement from an animal psychologist as to its feasibility. He was understandably surprised to learn of our work with pigeons but seized upon it eagerly, and citing it in support of his contention that dogs could be trained to steer torpedoes he went to a number of companies in Minneapolis. His project was rejected by everyone he approached; but one company, General Mills, Inc., asked for more information about our work with pigeons. We described the project and presented the available data to Arthur D. Hyde, Vice-President in Charge of Research. The company was not looking for new products, but Hyde thought that it might, as a public service, develop the pigeon system to the point at which a governmental agency could be persuaded to take over. Breland and I moved into the top floor of a flour mill in Minneapolis and with the help of Norman Guttman, who had joined the project, set to work on further improvements. It had been difficult to induce the pigeon to respond to the small angular displacement of a distant target. It would start working dangerously late in the descent. Its natural pursuit behavior was not appropriate to the characteristics of a likely missile. A new system was therefore designed. An image of the target was projected on a translucent screen as in a camera obscura. The pigeon, held near the screen, was reinforced for pecking at the image on the screen. The guiding signal was to be picked up from the point of contact of screen and beak. In an early arrangement the screen was a trans- lucent plastic plate forming the larger end of a truncated cone bearing a lens at the smaller end. The cone was mounted, lens down, in a gimbal bearing. An object within range threw its image on the translucent screen; and the pigeon, held vertically just above the plate, pecked the image. When a target was moved about within range of the lens, the cone continued to point to it. In another apparatus a translucent disk, free to tilt slightly on gimbal bearings, closed contacts operating motors which altered the position of a large field beneath the apparatus. Small cutouts of ships and other objects were placed on the field. The field was constantly in motion, and a target would go out of range unless the pigeon continued to control it. 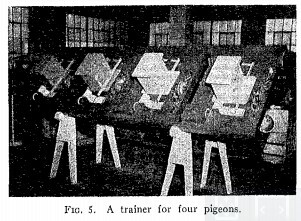 With this apparatus we began to study the pigeon's reactions to various patterns and to develop sustained steady rates of responding through the use of appropriate schedules of reinforcement, the reinforcement being a few grains occasionally released onto the plate. By building up large extinction curves a target could be tracked continuously for a matter of minutes without reinforcement. We trained pigeons to follow a variety of land and sea targets, to neglect large patches in- tended to represent clouds or flak, to concentrate on one target while another was in view, and so on. We found that a pigeon could hold the missile on a particular street intersection in an aerial map of a city. The map which came most easily to hand was of a city which, in the interests of inter- national relations, need not be identified. Through appropriate schedules of reinforcement it was possible to maintain longer uninterrupted runs than could conceivably be required by a missile. We also undertook a more serious study of the pigeon's behavior, with the help of W. K. Estes and Marion Breland who joined the project at this time. We ascertained optimal conditions of de- privation, investigated other kinds of deprivations, studied the effect of special reinforcements (for example, pigeons were said to find hemp seed particularly delectable), tested the effects of energizing drugs and increased oxygen pressures, and so on. We differentially reinforced the force of the pecking response and found that pigeons could be induced to peck so energetically that the base of the beak became inflamed. We investigated the effects of extremes of temperature, of changes in atmospheric pressure, of accelerations produced by an improvised centrifuge, of increased carbon di- oxide pressure, of increased and prolonged vibration, and of noises such as pistol shots. (The birds could, of course, have been deafened to eliminate auditory distractions, but we found it easy to maintain steady behavior in spite of intense noises and many other distracting conditions using the simple process of adaptation.) We investigated optimal conditions for the quick development of discriminations and began to study the pigeon's reactions to patterns, testing for induction from a test figure to the same figure inverted, to figures of different sizes and colors, and to figures against different grounds. A simple device using carbon paper to record the points at which a pigeon pecks a figure showed a promise which has never been properly exploited. We made another demonstration film and renewed our contact with the Office of Scientific Re- search and Development. An observer was sent to Minneapolis, and on the strength of his report we were given an opportunity to present our case in Washington in February 1943. At that time we were offering a homing device capable of reporting with an on-off signal the orientation of a missile toward various visual patterns. The capacity to respond to pattern was, we felt, our strongest argument, but the fact that the device used only visible radiation (the same form of information available to the human bombardier) made it superior to the radio controlled missiles then under development because it was resistant to jamming. Our film had some effect. Other observers were sent to Minneapolis to see the demonstration itself. The pigeons, as usual, behaved beautifully. One of them held the supposed missile on a particular intersection of streets in the aerial map for five minutes although the target would have been lost if the pigeon had paused for a second or two. The observers returned to Washington, and two weeks later we were asked to supply data on (a) the population of pigeons in the United States (fortunately, the census bureau had some figures) and (b) the accuracy with which pigeons struck a point on a plate. There were many arbitrary conditions to be taken into account in measuring the latter, but we supplied possibly relevant data. At long last, in June 1943, the Office of Scientific Research and Development awarded a modest contract to General Mills. Inc. to "develop a homing device." At that time we were given some information about the missile the pigeons were to steer. The Pelican was a wing steered glider, still under development and not yet successfully steered by any homing device. It was being tested on a target in New Jersey consisting of a stirrup shaped pattern bulldozed out of the sandy soil near the coast. The white lines of the target stood out clearly against brown and green cover. Colored photo- graphs were taken from various distances and at various angles, and the verisimilitude of the re- production was checked by flying over the target and looking at its image in a portable camera obscura. Because of security restrictions we were given only very rough specifications of the signal to be supplied to the controlling system in the Pelican. It was no longer to be simply on-off; if the missile was badly off target, an especially strong correcting signal was needed. This meant that the quadrant- contact system would no longer suffice. But further requirements were left mainly to our imagination. The General Mills engineers were equal to this difficult assignment. "With what now seems like unbelievable speed, they designed and constructed a pneumatic pickup system giving a graded signal. A lens in the nose of the missile threw an image on a translucent plate within reach of the pigeon in a pressure sealed chamber. Four air valves resting against the edges of the plate were jarred open momentarily as the pigeon pecked. The valves at the right and left admitted air to chambers on opposite sides of one tambour, while the valves at the top and bottom admitted air to opposite sides of another. Air on all sides was exhausted by a Venturi cone on the side of the missile. When the missile was on target, the pigeon pecked the center of the plate, all valves admitted equal amounts of air, and the tambours remained in neutral positions. But if the image moved as little as a quarter of an inch off-center, corresponding to a very small angular displacement of the target, more air was admitted by the valves on one side, and the resulting displacement of the tambours sent appropriate correcting orders directly to the servo system. 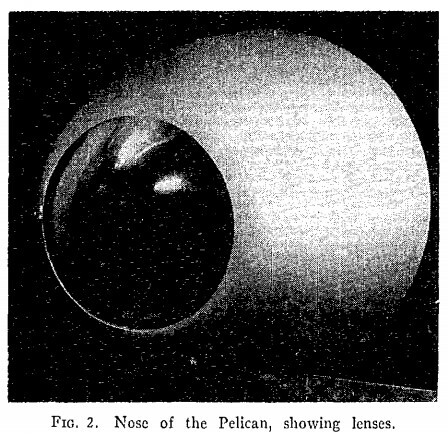 The arrangement in the nose of the Pelican is shown in Figure 3. Three systems of lenses and mirrors, shown at the left, throw images of the target area on the three translucent plates shown in the center. The ballistic valves resting against the edges of these plates and the tubes connecting them with the manifolds leading to the controlling tambours may be seen. A pigeon is being placed in the pressurized chamber at the right. 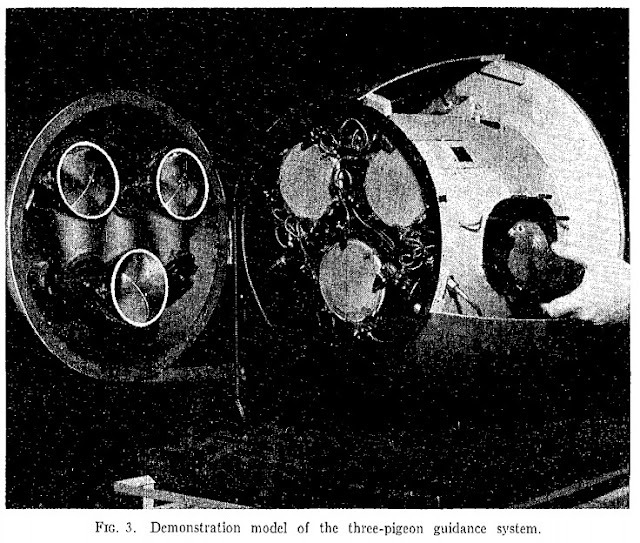 The General Mills engineers also built a simulator (Figure 4)—a sort of Link trainer for pigeons —designed to have the steering characteristics of the Pelican, in so far as these had been communicated to us. Like the wing steered Pelican, the simulator tilted and turned from side to side. When the three-bird nose was attached to it, the pigeons could be put in full control—the "loop could be closed"—and the adequacy of the signal tested under pursuit conditions. Targets were moved back and forth across the far wall of a room at prescribed speeds and in given patterns of oscillation, and the tracking response of the whole unit was studied quantitatively. Meanwhile we continued our intensive study of the behavior of the pigeon. Looking ahead to com- bat use we designed methods for the mass production of trained birds and for handling large groups of trained subjects. We were proposing to train certain birds for certain classes of targets, such as ships at sea, while special squads were to be trained on special targets, photographs of which were to be obtained through reconnaissance. A large crew of pigeons would then be waiting for assignment, but we developed harnessing and training techniques which should have solved such problems quite easily. A multiple unit trainer is shown in Figure 5. Each box contains a jacketed pigeon held at an angle of 45° to the horizontal and perpendicular to an 8" X 8" translucent screen. A target area is projected on each screen. Two beams of light intersect at the point to be struck. All on-target responses of the pigeon are reported by the interruption of the crossed beams and by contact with the translucent screen. Only a four-inch, disk shaped portion of the field is visible to the pigeon at any time, but the boxes move slowly about the field, giving the pigeon an opportunity to respond to the target in all positions. The positions of all reinforcements are recorded to reveal any weak areas. A variable-ratio schedule is used to build sustained, rapid responding. By December 1943, less than six months after the contract was awarded, we were ready to report to the Office of Scientific Research and Development. Observers visited the laboratory and watched the simulator follow a target about a room under the control of a team of three birds. They also reviewed our tracking data. The only questions which arose were the inevitable consequence of our lack of information about the signal required to steer the Pelican. For example, we had had to make certain arbitrary decisions in compromising between sensitivity of signal and its integration or smoothness. A high vacuum produced quick, rather erratic movements of the tambours, while a lower vacuum gave a sluggish but smooth signal. As it turned out, we had not chosen the best values in collecting our data, and in January 1944 the Office of Scientific Research and Development re- fused to extend the General Mills contract. The reasons given seemed to be due to misunderstandings or, rather, to lack of communication. We had already collected further data with new settings of the instruments, and these were submitted in a request for reconsideration. We were given one more chance. We took our new data to the radiation lab at the Massachusetts Institute of Technology where they were examined by the servo specialists working on the Pelican controls. 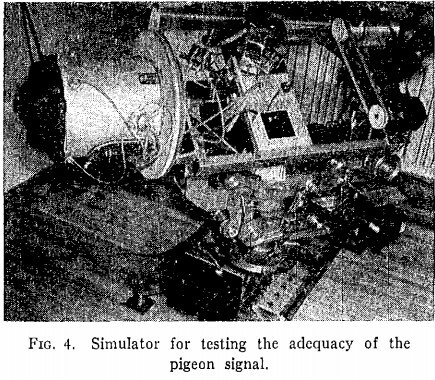 To our surprise the scientist whose task it was to predict the usefulness of the pigeon signal argued that our data were inconsistent with respect to phase lag and certain other characteristics of the signal. According to his equations, our device could not possibly yield the signals we reported. We knew, of course, that it had done so. We examined the supposed inconsistency and traced it, or so we thought, to a certain nonlinearly in our system. In pecking an image near the edge of the plate, the pigeon strikes a more glancing blow; hence the air admitted at the valves is not linearly proportional to the displacement of the target. This could be corrected in several ways: for ex- ample, by using a lens to distort radial distances. It was our understanding that in any case the signal was adequate (o control the Pelican. In- deed, one servo authority, upon looking at graphs of the performance of the simulator, exclaimed: "This is better than radar!" Two days later, encouraged by our meeting at MIT, we reached the summit. We were to present our case briefly to a committee of the country's top scientists. The hearing began with a brief report by the scientist who had discovered the "inconsistency" in our data, and to our surprise he still regarded it as unresolved. He predicted that the signal we reported would cause the missile to "hunt" wildly and lose the target. But his prediction should have applied as well to the closed loop simulator. Fortunately another scientist was present who had seen the simulator performing under excellent control and who could confirm our report of the facts. But reality was no match for mathematics. The basic difficulty, of course, lay in convincing a dozen distinguished physical scientists that the behavior of a pigeon could be adequately controlled. We had hoped to score on this point by bringing with us a demonstration. A small black box had a round translucent window in one end. A slide projector placed some distance away threw on the window an image of the New Jersey target. In the box, of course, was a pigeon—which, incidentally, had at that time been harnessed for 35 hours. Our intention was to let each member of the committee observe the response to the target by looking down a small tube; but time was not available for individual observation, and we were asked to take the top off the box. The translucent screen was flooded with so much light that the target was barely visible, and the peering scientists offered conditions much more unfamiliar and threatening than those likely to be encountered in a missile. In spite of this the pigeon behaved perfectly, pecking steadily and energetically at the image of the target as it moved about on I he plate. One scientist with an experimental turn of mind intercepted the beam from the projector. The pigeon stopped instantly. When the image again appeared, pecking began within a fraction of a second and continued at a steady rate. It was a perfect performance, but it had just the wrong effect. One can talk about phase lag in pursuit behavior and discuss mathematical predictions of hunting without reflecting too closely upon what is inside the black box. But the spectacle of a living pigeon carrying out its assignment, no matter how beautifully, simply reminded the committee of how utterly fantastic our proposal was. I will not say that the meeting was marked by unrestrained merriment, for the merriment was re- strained. But it was there, and it was obvious that our case was lost. Hyde closed our presentation with a brief summary: we were offering a homing device, unusually resistant to jamming, capable of reacting to a wide variety of target patterns, requiring no materials in short supply, and so simple to build that production could be started in 30 days. He thanked the committee, and we left. As the door closed behind us, he said to me: "Why don't you go out and get drunk!" In the years which followed there were faint signs of life. Winston Churchill's personal scientific ad- visor, Lord Cherwell, learned of the project and "regretted its demise." A scientist who had had some contact with the project during the war, and who evidently assumed that its classified status was not to be taken seriously, made a good story out of it for the Atlantic Monthly, names being changed to protect the innocent. Oilier uses of animals began to be described. The author of the Atlantic Monthly story also published an account of the "incendiary bats." Thousands of bats were to be released over an enemy city, each carrying a small incendiary time bomb. The bats would take refuge, as is their custom, under eaves and in other out-of-the-way places; and shortly afterwards thou- sands of small fires would break out practically simultaneously. The scheme was never used be- cause it was feared that it would be mistaken for germ warfare and might lead lo retaliation in kind. 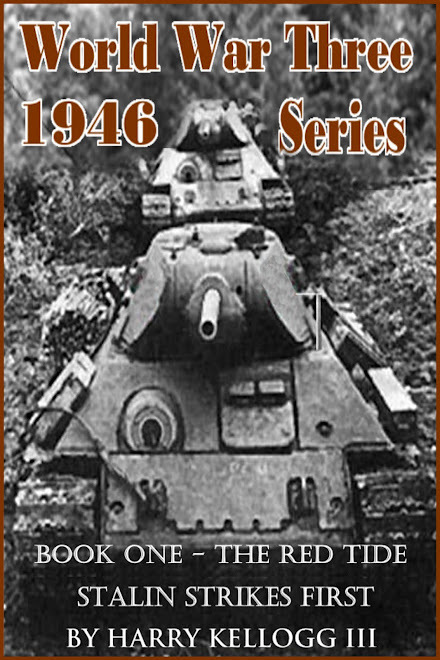 Another story circulating at the time told how the Russians trained dogs to blow up tanks. I have described the technique elsewhere (Skinner, 1956). A Swedish proposal to use seals to achieve the same end with submarines was not successful. The seals were to be trained to approach submarines to obtain fish attached to the sides. They were then to be released carrying magnetic mines in the vicinity of hostile submarines. The required training was apparently never achieved. I cannot vouch for the authenticity of probably the most fantastic story of this sort, but it ought to be recorded. The Russians were said to have trained sea lions to cut mine cables. A complicated device attached to the sea lion included a motor driven cable-cutter, a tank full of small fish, and a device which released a few fish into a muzzle covering the sea lion's head. In order to eat, the sea lion had to find a mine cable and swim alongside it so that the cutter was automatically triggered, at which point a few fish were released from the tank into the muzzle. When a given number of cables had been cut, both the energy of the cutting mechanism and the supply of fish were exhausted, and the sea lion received a special stimulus upon which it re- turned to its home base for special reinforcement and reloading. At the Naval Research Laboratory in Washington the responses of pigeons were studied in detail. Average peck rate, average error rate, average hit rate, and so on were recorded under various conditions. 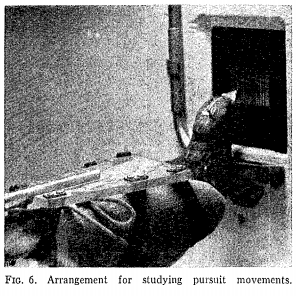 The tracking behavior of the pigeon was analyzed with methods similar to those employed with human operators (Figure 6}. Pattern perception was studied, including generalization from one pattern to another. A simulator was constructed in which the pigeon controlled an image projected by a moving-picture film of an actual target: for example, a ship at sea as seen from a plane approaching at 600 miles per hour. 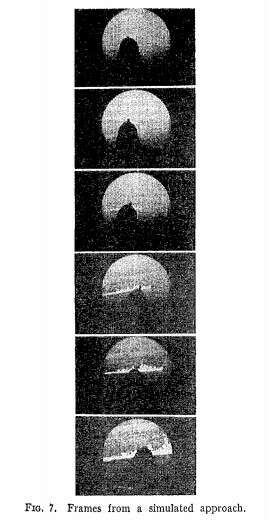 A few frames of a moving picture of the pigeon controlling the orientation toward a ship during an approach are shown in Figure 7.